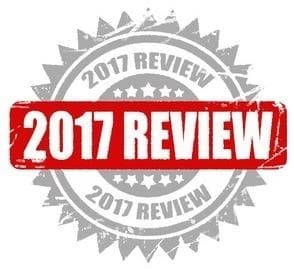 Kluge would like to thank our customers and vendors for making 2017 a great year. In June Brandtjen & Kluge (Kluge) and Kurz Transfer Products, L.P. (Kurz) announced a new strategic partnership co-marketing the Kurz DIGITAL METAL® technology in the US and Canada. The DM-LINER® allows a digital transfer of metallizations onto paper and cardboard substrates. The transfer process is upstream of the digital color printing. At the heart of the process is the DM-LINER®, a digital foiling device that precisely completes the foil transfer, optimizes foil usage and manages inventory intelligently. The DIGITAL METAL® process is highly effective in producing decorative effects for labels, brochures, invitations, magazines, packaging, photo cards, calendars and much more! The designs to be metallized are first printed with toner or electro-ink; then the DIGITAL METAL® foil is transferred by the DM-LINER® and the PET carrier is removed. For processing, the DM-LINER® can be supplied by sheets as well as rolls. The addition of an unstacker and stacker allows the basic machine to be used for digital sheet-fed printing. Kluge and Kurz presented the DM-LINER at Odyssey 2017 in May and again at PRINT17 in September. Recently Kluge has hosted customers in St. Croix Falls, Wisconsin to demonstrate this machine and its capabilities. Kluge commercially released the ApexFoil™ Foil Stamping, Embossing and Diecutting Press in September at PRINT17. 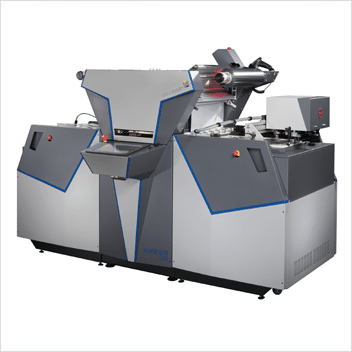 This new machine is the evolution of the EHD/EHF Series of Presses, which is the world’s best-selling small format foil stamping and diecutting press as of December 2017. The results of using this machine is a faster, more accurate workflow with the high quality you’d expect from a Kluge. 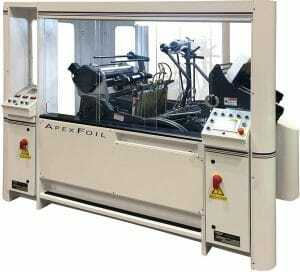 The key properties of foil stamping are simple to identify: Time, Temperature and Tonnage. Until now, although simple to identify, those properties have been difficult to measure and control. Now, operators can use the ApexFoil’s Compass™ control system that includes patented features to control the “3-T’s” Time, Temperature and Tonnage. Compass allows operators to greatly reduce and in some cases, eliminate make-ready on every job. Post Press Specialties made history in October of 2017 by installing the new machine. Replacing a 1971 Kluge machine.